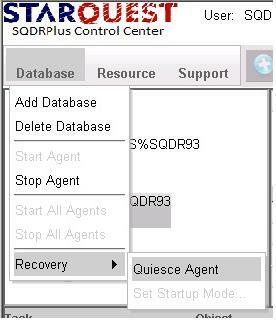 To quiesce a Capture Agent, select the Agent and choose Quiesce Agent from Recovery submenu of the Database menu. Upon receipt of the Quiesce request, the Capture Agent terminates the pruning, publishing, and client notification threads. It then notifies each replication worker (one per journal/log being processed) to quiesce its operation. The replication worker will process any outstanding log/journal records until a call to the log/journaling API returns no records. The replication worker will then enter a quiesced state, where it will remain until the Capture Agent is stopped. To monitor the state of the Capture Agent's replication workers, select the Agent in the left panel and select the Subscriptions panel in the right panel. Once all replication workers have entered quiesced state, you can be assured that all log/journal entries have been processed and placed in the capture agent's staging tables, assuming that no new activity has been allowed on the subscribed tables after the replication worker entered quiesced state. If a replication worker experiences a resource failure while processing in this mode, the Capture Agent will restart the worker and, barring other failures, will process any remaining log/journal entries, eventually entering quiesced state.